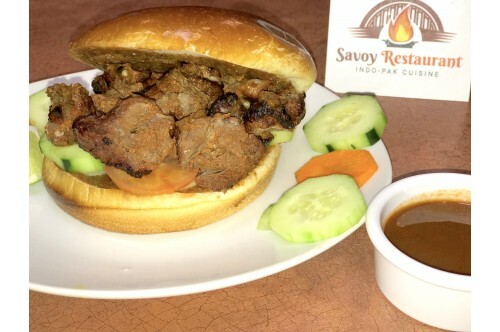 Barbecued thin juicy slices of beef marinated in fresh herbs between hot burger buns with Savoy's savory sauces and spices. Stone grind beef mince with aromatic garam masalas made on a tawa between hot burger buns with Savoy's savory sauces and spices. 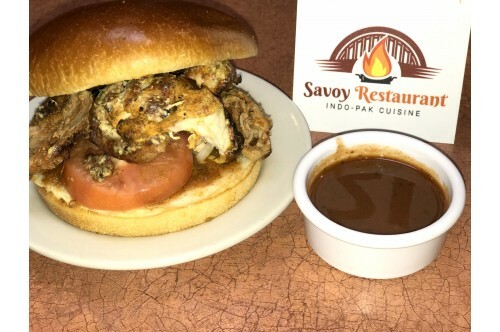 Barbecued thin slices of boneless chicken marinated in fresh herbs between hot burger buns with Savoy's savory sauces and spices. Stone grind chicken leg mince with aromatic garam masalas made on a tawa between hot burger buns with Savoy's savory sauces and spices.